The problem with this proposition is that in warm interglacials, all evidence to date suggests that summer refugia for sea ice would have been around the Queen Elizabeth Islands in the central Canadian Arctic, and north of Ellesmere Island and Greenland, where the thickest multiyear ice occurs today. Consequently, it is highly unlikely that Svalbard would have been an “interglacial refugium” for polar bears. 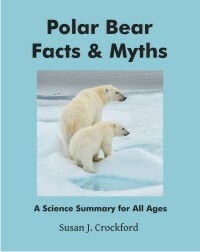 In addition, the period proposed by Miller and colleagues as conducive to the evolution of the polar bear as an Arctic-adapted species (4-5 million years ago) was considerably warmer than the Pleistocene (which began about 2.5 mya), with no evidence that there was even as much perennial sea ice as we have today in the Arctic. It remains to be demonstrated whether polar bears could have evolved under the relatively low ice conditions that appear to have existed 4-5 million years ago. See below for details. Figure A. Arctic sea ice age (and relative thickness) for 2010, maximum in March, minimum in April. Yellow box marks the area of persistent multiyear ice (patches coloured green) north of the Queen Elizabeth Islands, Ellesmere Island and NW Greenland that likely survived even in warm interglacials. I’m going to start this discussion with the issue of the proposed 4-5 million year age for polar bears, because the references cited by Miller et al. actually refute this proposal and lead us into the issue of Svalbard as a potential interglacial refugium. A careful examination of the geological evidence for the history of Arctic sea ice shows that an origin for polar bears 4-5 million years ago predates extensive multiyear (perennial) sea ice in the Arctic, even if there was some. 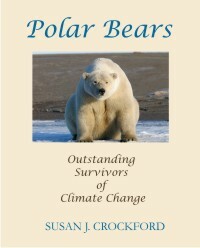 It beggars belief, in my opinion, that polar bears evolved under low ice conditions – and far more plausible that they arose at a time when continental ice sheets were developing over the Northern Hemisphere (where brown bears lived) and where extensive sea ice offshore would have developed as a consequence. So, one of the pieces of ‘evidence’ for climatic change conducive to the evolution of Arctic-adapted polar bears 4-5 million years ago cited by Miller et al. 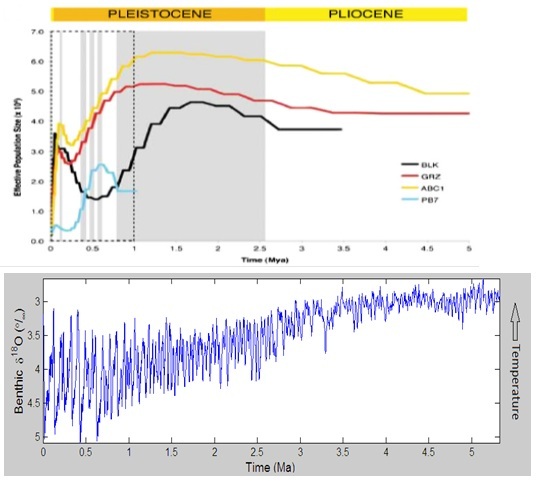 comes not from a geological paper on Arctic sea ice 4-5 million years ago but from another genetics paper (Krause et al. 2008) that refers to rapid radiations in terrestrial species associated with climatic change and the “emergence of new ecological niches, such as open grassland.” Not a mention anywhere of sea ice in the Arctic (or anywhere else, for that matter) in Krause et al. 2008. The second reference cited by Miller et al. in support of an origin for polar bears 4-5 million years ago is Polyak et al. (2010). Here is what Polyak et al. say (pg. 1766-67) about this period of time: “throughout the late Miocene and most of the Pliocene climate was still considerably warmer than in the Pleistocene.” Floral remains (logs and other woody detritus) in the western Canadian Arctic (Northern Beaufort Sea) from 5.3-3.0 Ma, they contend, “are not compatible with the existence of extensive perennial sea ice in the adjacent Beaufort Sea during this time. Studies of the Mid-Pliocene climatic optimum indicate a strong flux of warm Atlantic waters into the Arctic.” [my bold] . Polyak et al (pg. 1769) mention evidence of low sea ice or ice-free conditions during the last Interglacial (MIS 5e, ca. 130,000-115,000 years ago) in several western Arctic locations (e.g. Bering Strait, Chukchi Sea) but there is no mention of the region around Svalbard being a sea ice refugium (persistent multiyear sea ice) during interglacial periods. In fact, the only regions mentioned by these authors in regards to persistent multiyear sea ice during interglacials are northern Greenland and Ellesmere Island. As Figure A (above) shows, the nearby Queen Elizabeth Islands, in the northern Canadian Arctic Archipelago (CAA), also harbor persistent multiyear ice (but not sampled for such paleo studies, as far as I can tell – perhaps because the ice there is so thick), it is likely that the band of islands bordering the Arctic on the North American side were the only ‘sea ice refugia’ that existed during interglacial warm periods. More research may change that conclusion but for now, that is the most plausible one. So, the geological evidence actually indicates that it is unlikely that there was a sea ice refugium around Svalbard during warm interglacials, as suggested by Miller et al. However, there probably was a refugium around the Queen Elizabeth Islands, northern Ellesmere Island and northern Greenland. The 130,000-115,000 year old fossil polar bear specimen from Svalbard (Lindqvist et al. 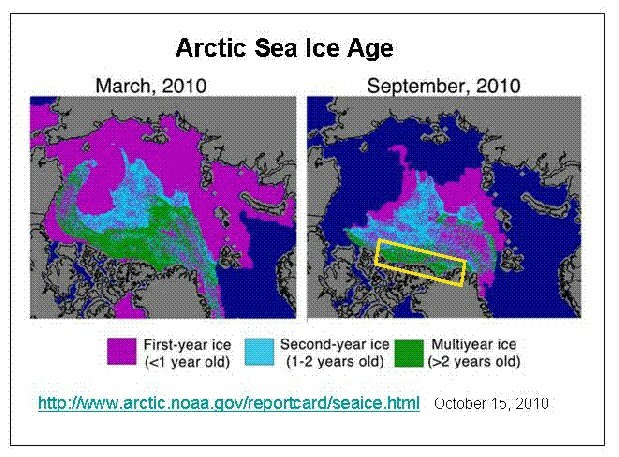 2010) likely died fortuitously in a location that was not destroyed by subsequent glacial advances/retreats and does not necessarily reflect unique sea ice conditions around Svalbard at that time. That is certainly some creative interpretation of the data at hand! Consider the temporal population data for the bear species derived by the authors compared with the relatively-well established general climate history of the earth. Figure 1 shows the full 5 million year record and Figure 2 shows just the last million years. Figure 1 (top): Estimates of the effective population size over the past 5 million years of the different bear species studied; BLK—black bears, GRZ—brown bears, ABC1—a different kind of brown bear, PB7—polar bears (source: Miller et al., 2012). 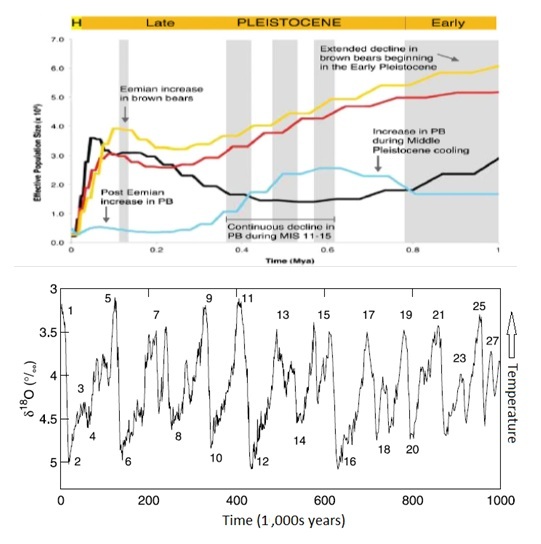 Figure 1 (bottom): General climate history of the earth for the past 5 million years as derived from a collection of ocean sediments (source: Lisiecki and Raymo, 2005). From World Climate Report July 26, 2012. Figure 2 (top): Estimates of the effective population size over the past 1 million years of the different bear species studied (as in Figure 1). The larger gray-shaded area on the right refers to the Early Pleistocene, and the other gray areas (from right to left) refer to the interglacial Marine Isotope Stages (MIS) 15, 13, and 11, and the Eemian, respectively. The arrows point to major events in bear population history discussed by the authors. 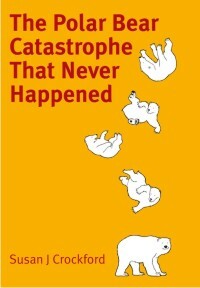 H, Holocene epoch. (source: Miller et al., 2012). Figure 2 (bottom): General climate history of the earth for the past 1 million years as derived from a collection of ocean core sediments. The numbers are the various MIS (source: Lisiecki and Raymo, 2005). From World Climate Report, July 26, 2012. Indeed. Miller et al.’s estimation of polar bear population size over time in no way mirrors the dramatic changes in climate that have occurred over the last one million years. This definition of ‘species’ is a simplified, short-hand version that many people have been taught but it is not entirely true. There are many exceptions to this rule and the more genetic studies that are done, the more we are finding that hybridization happens occasionally in many closely-related and not-so-closely related species (even those from different genera are known to hybridize and produce viable offspring that are capable of reproducing). The key word is occasional. Hybridization amongst a few individuals rarely has consequences for the species as a whole. Polar bears and brown bears have a long list of physiological, morphological, behavioral and life history characteristics that make them distinct from each other – a few incidents of hybridization does not negate those distinctions. See my previous post on hybridization for more details. The polar bear hybridization that is going on right now is limited in scope and geographic extent – it is confined to one small area of the western Canadian Arctic. Polar bears and brown bears are distinct and separate species by all biological standards, including genetics. Lindqvist, C., Schuster, S.C., Sun, Y., Talbot, S.L., Qi, J., Ratan, A., Tomsho, L., Kasson, L., Zeyl, E., Aars, J., Miller, W., Ingólfsson, Ó., Bachmann, L. and Wiig, Ø. 2010. Complete mitochondrial genome of a Pleistocene jawbone unveils the origin of polar bear. Proceedings of the National Academy of Sciences USA 107:5053-5057. Miller, W., Schuster, S.C., Welch, A.J., Ratan, A., Bedoya-Reina, O.C., Zhao, F., Kim, H.L., Burhans, R.C., Drautz, D.I., Wittekindt, N. E., Tomsho, L. P., Ibarra-Laclette, E., Herrera-Estrella, L., Peacock, E., Farley, S., Sage, G.K., Rode, K., Obbard, M., Montiel, R., Bachmann, L., Ingolfsson, O., Aars, J., Mailund, T., Wiig, O., Talbot, S.L., and Lindqvist, C. 2012. (in press). Polar and brown bear genomes reveal ancient admixture and demographic footprints of past climate change. Proceedings of the National Academy of Sciences 109:E2382-E2390. doi: 10.1073/pnas.1210506109. This entry was posted in Evolution, Sea ice habitat and tagged genetics, interglacial, Miller, Miocene, Pleistocene, polar bear evolution, refugium. Bookmark the permalink.